This is the last Boss battle as of 3.1 patch. You'll fight Bahamut! Summon 4 Louisoix - or Minions of Light WHM, but it will be harder with them. Start sending your Louisoix on Bahamut. Summon 6 Wind-up Gentlemen and send them with the main group. Be careful! 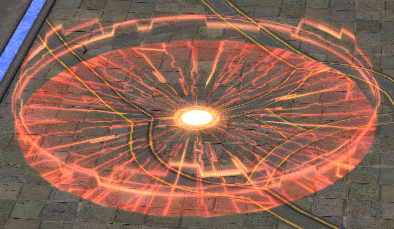 You will have to pay attention to your Minions all the time so they don't get hit by the circle AoE. If they stay in it, they will likely ALL die. Minions with a Speed of 4 can get out fast enough, but if they have a Speed of 3 you will need to be really quick about it! I haven't tested with a Speed of 2 or less, but I'm not sure you could get them out of the AoE in time. At some point, towers will start spawning. You need at least one Minion in it, or it'll explode and likely kill all your Minions. 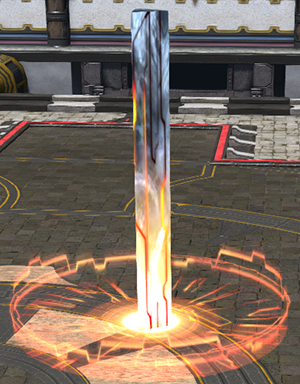 Several Minions will share damage, but I'd recommend to use only one fast Minion so you can continue DPSing Bahamut. Two Clockwork Twintania will also spawn at about the same time. I killed one of them and it was probably necessary, since I didn't have much life remaining when I beat Bahamut. Use your full group to kill one fast, then go back on Bahamut. This fight is all about reflex and paying attention to towers. "I tried to micromanage the units over and over like in the guide. It's incredible how fast your combo burns down the boss but I find myself failing to reach the meteors and wiping all my units quickly. So I won with a more defensive strategy. Starting out with summoning 4 Louisoix and sending them to defend the center aetheryte. Next I summoned 4 Haurchefant and avoiding the AOEs best I could. Now the Louisoix and Haurchefant use their abilities ASAP and focus on the boss. Finally I summoned 4 Amalj'aa. The Amalj'aa were scattered to cover the map. Their primary job was to be close to the meteors. A single Amalj'aa could take two meteors before dying. One on each aetheryte and then midway between the aetheryte. This was easier for me to make it to the meteor in time having 4 dedicated units for it. Then when necessary I would send some units to the adds. Failed a few times to reach meteors and got sloppy. Would summon 5 Lousoix to cover the boss and then focus Haurchefants on the adds till i could recover. Sprinkling in an Amalj'aa when I could. Both adds were defeated first and then back to focusing on the boss for the win."